Just don’t call a blog post a blog! I could not find a single source that defines a “blog” as the individual entry on a blog (aka a “blog post”). If you are able to find one, please share! It’s true that colloquial usage can morph into correct usage, and maybe that’s what’s happening. But until then, please don’t confuse your readers by implying that you wrote an entire, multi-entry blog on “10 reasons to take a nap right now” when you only wrote a single blog post. I frequently see articles and blog posts around the web espousing various tips and tricks to get your kids to eat healthy foods. Although I don’t have kids yet, I’ve certainly put some thought into how I plan to manage my eventual children’s diets. But I’m sure when the time comes, I’ll struggle to get my kids to eat their vegetables. What if I get the dreaded “picky eater”?? “Hiding” healthy foods isn’t such a good idea. (For example, concealing cauliflower in a macaroni & cheese dish. *) Your kids will catch on, and will become suspicious of food more generally. That’s definitely not a good thing! Model healthy eating for your kids. Even if they don’t like asparagus at first, if they see you eating it frequently, they might try it the 20th time. In fact, research shows that it can take 10-20 exposures for a child to begin liking a new food. Your kids won’t starve. Your job is to provide them lots of healthy options, but they get to choose whether and how much they eat. 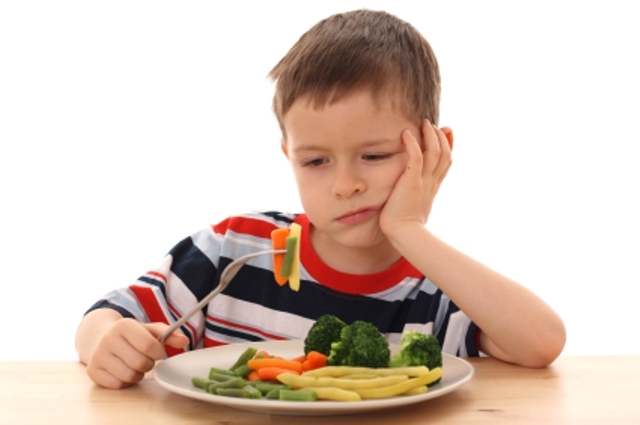 Never force your child to eat something – that will only create negative emotions around that particular food. I’ll remember these tips when the time comes, and will be sure never to label my child a “picky eater”! Do you have any strategies to encourage your kids to eat something other than goldfish crackers? If so, please share! *Making cauliflower mac & cheese is a great idea – but no need to keep the ingredients a secret! Here’s an all-too common scenario: Three presenters are scheduled to speak at a seminar, for 15 minutes each. The first two presenters go way over their allotted time, despite the timekeeper’s hand signals, in order hit upon every point they intended to make. The third presenter then comes up to bat, acutely aware that his or her time has been cut short. (S)he blows through his/her slides or notes, lamenting the lack of time, skipping the less-important or already-covered sections in favor of a few key messages. Recently, I was the third presenter. I didn’t have PowerPoint slides, but had a long list of hand-written notes I intended to cover. The meeting started a bit late, and the two presenters before me went 5-10 minutes over their allotted time, so that by my turn, I was starting five minutes after I was originally supposed to end my talk. Even though I was allowed to take my full ten minutes, I knew that every minute I spoke would take a minute away from the discussion part of the meeting (undoubtedly the most valuable part). So I had to speak quickly. As I glanced down at my notes, my brain automatically crossed off about half of the talking points on the page. That one’s not as important. That one’s self-evident. That one can be covered during the discussion. Instead I focused on the most salient and most interesting points, and expressed my desire to continue the conversation. So the question is – if many of my points could be casually cut from the presentation, why did I include them in the first place? I think most presenters will agree that they try to squeeze too much content into any given talk, even knowing that the audience will only retain a few major points. 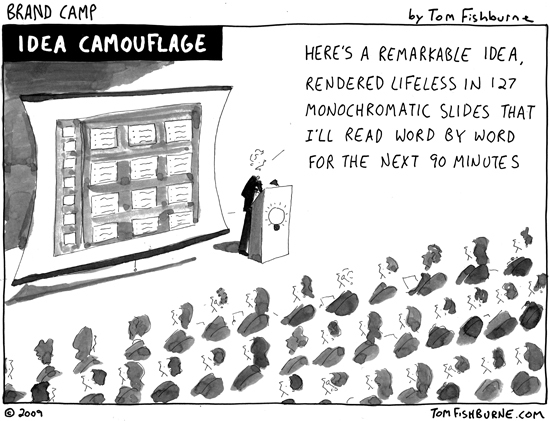 This experience gave me an idea for a way to streamline future presentations. The strategy is simple: pretend that you are the third presenter. Prepare a fifteen minute presentation as normal, but then pretend that you’re only allowed, say, seven minutes to talk. Practice out loud, using a countdown timer, to make sure that the time pressure is on. What messages and slides do you keep? What do you cut? Hopefully you will emerge with clearer picture of where the strength of your presentation lies. Go back and edit your presentation, focusing on the essential messages that you want the audience to retain. Plan for a clean, concise talk that goes under your allotted time. How many times have your started a household chore or project – folding the laundry, sorting through old papers, decorating the walls – but stopped partway through? In our homes, we have the freedom to leave projects unfinished or dishes unwashed. In an attempt to counteract this tendency, I developed a very basic mantra for myself – complete the task. It provides a useful nudge to prioritize the unfinished chores or projects before starting any new ones. Just cooked a delicious dinner, but thinking of leaving the dishes for tomorrow? Complete the task. Paid some of your monthly bills, but letting a few linger? Complete the task. Started organizing the pantry last weekend but never finished? Complete the task. What do all of these tasks have in common? They all take less than a minute to complete. One rule that I’ve found very useful for household management is to never put off a chore that can be conquered in 60 seconds or less. A minute here and there should have little effect on your day. But if you continually put off the quick, easy chores for a couple of days, you’ll wind up with a major clean-up on your hands. I try to keep the 60 second rule at the forefront of my mind, so that I don’t procrastinate on simple tasks. Conquering the low-hanging fruit of chores keeps a house clean and livable. This time-tested saying has definitely helped me organize my living space. To abide by it, every item in your home should have its own “place,” or a spot where it belongs. This goes not just for the obvious pairings – socks in the sock drawer – but for every knick-knack, piece of paper, food item, and toiletry. If an item doesn’t have a proper place, then you must either make a place for it, or get rid of the item. This doesn’t mean you have to get rid of all the miscellaneous or useless items in your home, but it does mean they need a designated spot, even if it’s just in the “junk box” under your bed. Once this rule is enforced, then cleaning & organizing becomes a matter or returning everything to its proper place. I think this feels much less daunting. Do you have any mantras or rules that you use to keep your living space in order? I’d love to hear other suggestions, as I am always striving for a cleaner, less-cluttered home! When I checked in at Dulles, I was given my boarding passes for the first two legs, but not the third. The attendant at the check-in counter told me that I would need to get my third boarding pass at the airport in Abu Dhabi. “No problem,” I thought. “That’s just how things are done. I have a four-hour layover, so it will be fine.” Not so. Due to fog issues, there were massive delays and glacially-paced queues at the Abu Dhabi airport. My travel companions and I seemingly had no shot at getting our boarding passes in time. By the time we actually found an airport official to help us, still an hour before our flight, our seats had been given away to stand-by passengers because we hadn’t checked in. Of course, employees at the Abu Dhabi airport were confused as to why we didn’t already have our boarding passes in the first place, and said we could have gotten them at the initial Dulles check-in. Sigh. We wound up being re-booked on another flight to Kathmandu the next day, spending the night at a hotel in Abu Dhabi, and arriving a day later than planned. I have a tendency to overpack, as I suspect most travelers do. But being without my suitcase reminded me how little I actually need on a trip. For five days, I lived a blissfully simple existence, with zero clothing choices and only the most basic of toiletries. On future trips, I intend to pack a very simple wardrobe with easily-washable items and no frills. When your bag doesn’t show up at baggage claim, you are required to fill out a passenger property form to report it. The attendant should provide you with a 10-digit WorldTracer file reference number that you can use to track your bag. For whatever reason, the person I was working with did not write the number on my form, and I had to call United Airlines later to request it. I’ve gotten in the habit of snapping quick photos of all necessary travel documents with my cell phone. You never know when you might lose one of those tiny pieces of paper…or be asked to provide one to an airline staff member and not get it back. Invest in a worldwide power adapter and keep it on you. You never know when you might need to charge your cell phone and not be able to find the right kind of outlet. I completely forgot that I needed a travel adapter and had to borrow from others. 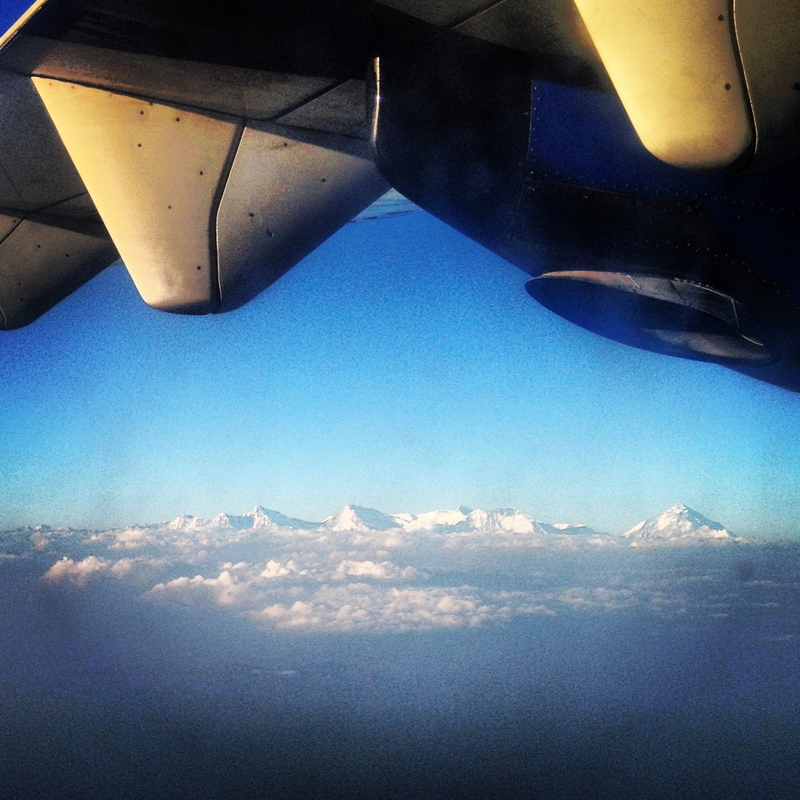 My original itinerary had me arriving in Kathmandu with a day to spare before my conference, during which I had planned to explore and enjoy the city. However, due to my travel delays, I arrived a day later than planned. Thank goodness I had that extra day built in, or else I might have missed the first day of my meeting. However, from now on I am going to build in any vacation days at the end, rather than the beginning, of my work trips, to ensure I don’t miss out on the opportunity for some free time in a new place. I also think that one is more prepared (and less jet-lagged) at the end of the trip for doing some relaxing and exploring. Do you have any rules of thumb to make sure your international travel experiences run smoothly?